Green Gate Access Systems did Kent proud at the home of Liverpool FC, after its SOSEC® range of products were recognised as one of the year's top innovations at the 2016 Builder and Engineer Awards. Now in its 13th year, the awards act as a platform to recognise some of the most innovative new products, the best projects, and well established companies and manufacturers in the UK construction industry. SOSEC, the UK's first mobile powered barrier and gate system, only launched in October, but is already creating a buzz with a successful trial by UK developers Kier Living and Tarmac Group, resulting in the product being rolled out to more than 30 sites. Interest is growing across the sector with Taylor Wimpey among the big developers considering take up of the product with trials set to begin later this month. This potential was recognised at the awards evening held at Anfield's new main stand on 30th November with Green Gate Access Systems reaching the final four in the Product/Innovation of the Year category. 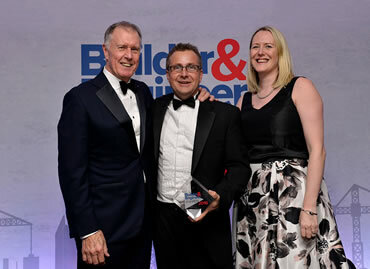 Despite missing out on the award, managing director of Green Gate Access Systems, Neil Sampson, was drafted on stage to collect the award on behalf of Perpetual V2G and received a hearty handshake and congratulations from World Cup winner, Sir Geoff Hurst MBE. The Product/Innovation of the Year award recognises those innovators and designers, working alongside the construction industry, that help companies do their jobs smarter, safer, more efficiently and more productively. The judging panel praised SOSEC for its innovative and green approach to providing security and protecting the general public. The UK's first mobile, solar powered barrier and gate system, unveiled for the first time at the Kent Construction Expo in October, is a revolutionary new approach to securing work sites. Harnessing the sun's energy, SOSEC doesn't need a power source and can easily be adapted and moved to be used wherever it's needed. Owing to its flexibility, SOSEC has a wide number of applications including in the construction, retail, events, highways, emergency, and mining markets. Outside construction, its uses for temporary road works are being explored in a joint partnership with Detling, Kent based business Highway Care. The product's solar power and power storage ability are unique and allow the barrier to operate up to 900 times a day even in an average British winter. SOSEC can also be delivered with a battery store for up to one month's use. The awards are judged by an independent panel of industry leaders, and are organised by Building & Engineer Magazine — a leading sector title which circulates to 30,000 construction professionals.